The Chilean potato vine Solanum Crispum is just the vigorous climber to give your sunny wall an exotic look. It has wiry stems which need tying up to wires or trellis for support. Prune and tie in to retain the required shape. The small semi-evergreen leaves remain on the plant in all but bad winters and easily reach 6 feet tall. 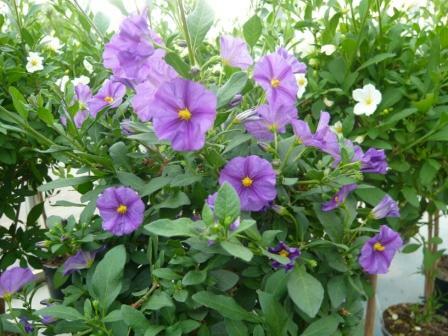 The potato-like flowers with lilac petals around a pointed yellow centre, appear continuously from mid-summer to mid-autumn. The variety ‘Glasnevin’ is the one to choose, as it flowers more prolifically and is also slightly hardier. They are pest and disease free once established. 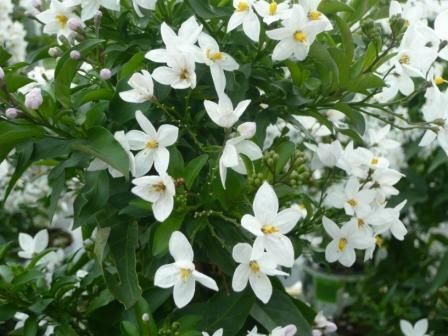 Plants like a moist but well-drained soil that is neutral to slightly alakaline in pH. Solanum aethiopicum, Solanum crispum, Solanum dulcamara, Solanum elaeagnifolium, Solanum jasminoides, Solanum laciniatum, Solanum laxum, Solanum lycopersicum, Solanum macrocarpon, Solanum mammosum, Solanum melongena, Solanum muricatum, Solanum nigrum, Solanum pseudocapsicum, Solanum quitoense, Solanum rantonnetii, Solanum torvum and Solanum tuberosum your humble potato.